Jack Morell is a desperate man. After receiving a cryptic phone call from his uncle−a call spiked with the sound of gunfire in the background, he is frantic to locate his uncle's missing ship. Warned to use discretion, Jack opts to rent a boat from McKAY'S CHARTERS for his search. Together, Jack and Livvy uncover the contents of the footlocker and now they are being hunted. The books in this series are standalone and do not have to be read in order. Good maritime suspense novel. The author's research paid off in a well-founded plot with plausible events and problems and clever developments. The characters were likeable and the setting added a strong element of danger. I really enjoyed reading this book and will look for more of Maureen A. Miller's books. 5.0 out of 5 starsAnother sure win! Ms. Miller doesn’t disappoint in her second round with the mysterious company, BLUE-LINK. As a fan of the genre, I can tell you Ms. Miller always gets it right. Combining adventure, mystery and romance into the binding of a book is what she does best. However, in MIST I couldn’t help but notice that she has gotten a little soft on us. Jack and Livvy feel differently than many of her previous protagonists; there’s an easy kind of love and tenderness between them, which we, or at least I, haven’t seen from the author’s other couplings so soon. It was a welcomed change of pace. From ominous scenes in Livvy’s home to those on the trawler, rocking off-shore in the cold Atlantic the plot is brilliantly written with plenty of suspense to keep you entertained up until the very last page. Both Livvy and Jack are bearing some scars of the past, which determine their actions going forward through this exhilarating tale. Livvy is strong and independent, without being overbearing. Jack is rugged, yet his actions are truly swoon-worthy. Ms. Miller takes the time to develop her characters into lovable beings for her readers, as well as set the stage for the chilling ride ahead. Every page is appreciated. This isn’t the first Maureen A. Miller book I’ve read, and it certainly will not be the last. Keep 'em coming, Maureen! 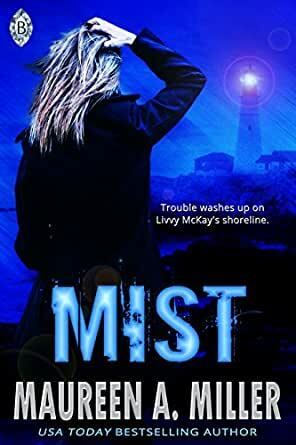 MIST by Maureen A. Miller is the second in her BLUE-LINK series and was another hit with me. The twists and turns of the plot made me keep turning the pages until I was done. The action started in the first chapter and did not slow down until about the 84% mark but I think that was just to allow me time to catch my breath before I was off again with the story. Olivia McKay is a strong and independent woman. I admired her grit and determination to continue the family business after losing her family. Jack Morrell is a softer Alpha hero than the usual types in romantic suspense but he is all male. He's a scientist with a military academy background which gives him the necessary experience to be the CSO of his uncle's research facility. Their relationship starts out rocky but as they get to know each other the attraction builds. That is something I appreciate in Ms. Miller's writing is that she develops the relationship between the hero and heroine slowly; and I always feel like they have a firm foundation before they disappear into the bedroom. Amanda Newton is back, although from a distance. I am definitely intrigued by her and can't wait for her backstory. Ms. Miller also introduced a new character from BLUE-LINK, Ray Gorden and I hope she has plans for him in the next book in this series as he also intrigues me. I am really looking forward to the next book in this series. First, I would point out that this book (the story, the way the story was told, the characters) is so much better than the first book in the series. Even though the story plot was not as intriguing as the first one (come one, it's hard to beat the-stalker-turn-out-to-be-the-hero thing), the story itself was much more developed with better details. What really evolved from the first book was the characters building. We got to know the characters from their each point of view, we witnessed their growth as well as their relationship. I felt so much more invested in these characters. Oh, one more thing that I like about this book. Although this is a blue-link book, the blue-link itself was not in the centre of this story, it was more in the peripheral, playing crucial part yet not front and centre. It's refreshing really, as most series that include a company would told stories about their employees. So, it's a really good read.